In Oregon, as well as throughout the country, medical assistants play an increasingly important role in the smooth and safe delivery of health care. Demand for well-trained medical assistants in Oregon is expected to be strong over the next decade-with the Bureau of Labor Statistics projecting nearly 27 percent job growth. You can find certificate, diploma, and associate degree programs in Oregon's private and community colleges. These programs prepare students to handle both the administrative and clinical demands of a modern medical office. Graduates of accredited schools can take an exam to become certified medical assistants (CMA), a credential that is often sought after by Oregon employers. Read on to find out more about certifications, schools, and salary information for medical assistants in Oregon. With health care being a growing field, now is a good time to earn a degree or certificate in medical assisting to get a foot in the door. A medical assistant takes vital signs of patients and assists with some of the office paperwork, like ensuring that patient records are updated. If this is a field you’re interested in, it’s important to do your research before settling on a school or a program. 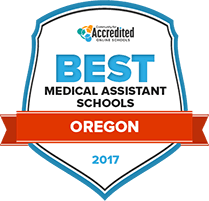 We’ve compiled a list of the 2017 Best Schools for Medical Assisting in Oregon to help save you some time. Taking into account a number of factors, like financial aid resources and career placement. See who made the cut for 2017 below. Students at Southwestern Oregon Community College can choose from three medical certificate programs, each with different concentrations, as well as a full associate degree program. The school and its degrees are accredited by the Northwest Commission on Colleges and Universities. The library offers students a broad range of research tools and other academic resources, and the Learning Commons is specifically designed to satisfy a wide range of academic needs for all students. An online orientation is offered to new students preparing to begin college to help them get acclimated and to prepare them for academic success. Nearly 20 local organizations, agencies and medical entities support the medical assisting program at Rogue Community College. When they finish the program successfully, graduates will be qualified to sit for the National Healthcareer Association (NHA) CCMA exam, which is one avenue toward earning credentials needed to work in the field. In order to begin the highly competitive program, students must first attend an informative session. Graduates will be prepared to work in a variety of settings in both a clinical and administrative capacity. Students will benefit from a wide range of resources, including career services, counseling and academic advising. The Linn-Benton medical assisting program is a two-year academic journey that culminates in an associate of applied science degree. Class cohorts start every fall for the program, which comes with enrollment limits and unique admissions requirements. Students will receive council from academic advisors who are also instructors, and are therefore qualified to offer degree-specific guidance. Student support services include child care, disability resources and special services for veterans. At-risk students can receive specialized attention through the Student Success center. Students can also get help with math and writing, and they have access to a student help desk. There is more to finding the right school than simply finding a program that fits your budget and your timeline. You want to make sure the program offers the kinds of courses that will prepare you for the kind of career you want. Some programs include a hands-on externship that provides real world training in clinical and administrative duties. They also include specific training in clinical tasks such as EKGs, venipuncture and phlebotomy. Use this tool to research community, private and technical schools with medical assistant training programs in Oregon. How are medical assistants defined in Oregon? Oregon defines medical assistants as unlicensed medical personnel. As such, they are not allowed to practice medicine-such as performing assessments or provide invasive treatments for patients. However, they can perform a range of administrative and clinical tasks as delegated and supervised by a licensed medical professional. These duties may include EKGs, venipuncture, wound care and administering medications. Certification is not required in Oregon, though employers may strongly prefer to hire Certified Medical Assistants (CMAs). Is certification available in Oregon? Yes. The most common certification is the CMA, which is an exam-based credential administered by the American Association of Medical Assistants. CMA candidates must be recent graduates of medical assisting programs accredited by the Commission on Accreditation of Allied Health Education Programs (CAAHEP) or Accrediting Bureau of Health Education Schools (ABHES). There are several other nationally recognized credentials. In Oregon, formal education and training, while not required, is strongly preferred. Oregon schools and employers may require a background check, immunizations, and drug screening. Are there tasks outside the scope of medical assistants in Oregon? Oregon law considers medical assistants to be unlicensed healthcare personnel, as opposed to nurses and physicians, who must be licensed. They may perform clinical tasks delegated and supervised by licensed practitioners, but they are not allowed to practice medicine. According to data from the Bureau of Labor Statistics, Oregon medical assistant salaries come in higher than the national average. Oregon medical assistant salaries can vary widely across the state, as illustrated by the numbers below. The medical assistant field is poised for considerable growth through the next decade. Improved access to health care and an aging population are behind the trend. Practitioners and institutions will increasingly rely on trained medical assistants to keep their offices running smoothly and ensure the safe and proper delivery of care. The AAMA site provides continuing education, advocacy, and credentialing for medical assistants-specifically the certified medical assistant (CMA) exam. This site contains the rules and statues governing the practice of medicine in Oregon and can provide guidance on the scope of practice for medical assistants in the state. This is the state chapter website for the American Association of Medical Assistants and has local chapters in Central Oregon, Klamath Falls, Lane, River Cities, Linn/Benton, and Marion/Polk. This social media site provides up-to-date information on events and educational opportunities for medical assistants in Oregon.